Having cystic fibrosis and being on the verge of undergoing a double lung transplant, is not on most people's list of things to do in one's lifetime. Young Laura Rothenberg's account of her build-up to this potentially life-changing operation, written almost as a diary, will have you thanking your lucky stars you're healthy, or, not as ill. Her thoughts on dying, waiting, friends visiting, and not, going back home to New York or back to hospital in Boston or back to Brown University in Providence, Rhode Island, had me catching my breath. 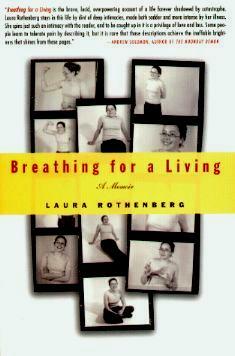 Then the day arrives that they "have lungs" for Laura and the start of her new life begins. Friends and family rally round and she pulls through this major surgery, not without complications, lots of them. Her diary and e-mails gently reflect what she had to endure - it must have been so much worse. As if that wasn't enough, she had inch-long tablets to take daily, bouts of diarrhea and nausea, a bloated face, biopsies by the dozen, and a round of acute bronchitis in her new right lung. Looking forward to a new life with activity and joy took longer to reach with all the precautions and change of diet, but I have to say, this is one very, very brave young woman. A few months after the transplant, things took a turn for the worse, with rejection setting in, as well as intestinal problems and nodules on her lungs. She made it through however. Conclusion - What a story! An important read for us all.